Slovenia’s coast is one of Europe’s bestkept secrets, said Joji Sakurai in the Financial Times. Because few people associate tiny Slovenia with the sea, its picturesque 30-mile-long coast has been able to “hide in plain sight” for generations—its “emerald” waters, “plunging” cliffs, and Venetian-style ports and villages enjoyed only by those in the know. I recently discovered those delights while living in Piran, “the jewel” of the Slovenian coast. Once part of the Republic of Venice, the town has the charm but not the crowds of that fabled city, which sits directly across the Adriatic. Piran also rewards visitors with “some of the most pristine beaches in the Mediterranean” and with hinterlands that call out to be explored on a mountain bike or on foot. 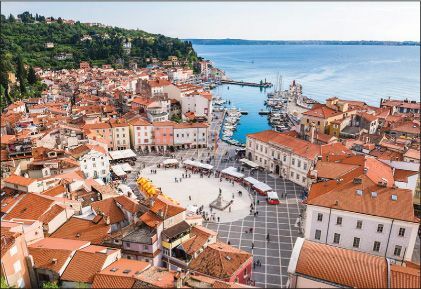 Hiking, biking, and swimming around Piran will leave you hungry, and “that’s a good thing, because its waters are alive with some of the tastiest fish in the Mediterranean.” Italians often drive across the border to feast on the bay’s sweet branzino, dondoli clams, and turbot. A hidden spot to enjoy these treasures is Ribic, which serves a delicious sea bass carpaccio topped with slivers of strawberry. Sit on the restaurant’s rustic terrace under the shade of an old olive tree, and savor the blissful sea breeze as it blows through a hedge of wildflowers.